Winter in Australia is full of fun in the alps of NSW, Vic and also Tasmania. There are also indoor venues dotted around the country that you can practice snowboarding and skiing and you don't need snow. Here we try and help with some shops that have genuine snow sales. We also include some notes on our experiences. Have a great snow season! Ballistyx are situated in Melbourne's east in Ringwood. Easy access with the Eastern Fwy right on the doorstep. This crew have been about coming up for 25 years. 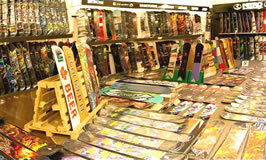 the team have always been big on snowboards for men and women. A great array of options and sizes to suit all shredders. They also have snow apparel so stop by to check out their latest wear. And a great Snow store for those heading overseas as strong with experience and connections here! In terms of Snow Sales, Ballistyx roll out various sales thru the winter season. A big roomy store where the staff are friendly and helpful. And parking out front is the premier spot if there is room. 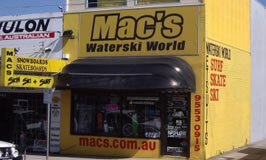 Coming up for 40 years of service to the Snow community Macs in Moorabbin is easy to find along South Rd on the east side near the intersection of Nepean Hwy. Where all the maze of traffic lights are with Jasper Rd, Station St and South Rd. A good place to park sneakily is in the Safeway car park around the corner! A great store with upstairs and the ground floor filled with equipment. Hey and they also hire from here too. Great service as the owners are pretty much the ones you will deal with. Not there on Sundays during there snow season as they are out playing in the alps! In terms of Snow Sales they tend to have rolling sales so check them out and ask them for the best they can do. Remember to factor in that Sale Value includes all the advice and years of experience! 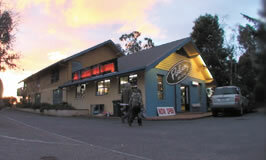 If heading to Mt Buller make sure to stop in at Pullins Ski Shop just past Mansfield on the Buller side of Mansfield where the BP is. Plenty of car parking here! Yes the have hire equipment. But if you need a specialist wax or repair then this is the place. The staff here are fantastic and know their stuff. In terms of Snow Sales, Pullins have a big sale on the Queens Birthday weekend. They tend to bring in a lot of stock of new snow gear and then they also have the run out of some of the previous years hire gear! Lots of kids gear aswell so if looking to fit out the little ones this could be the go! You won't miss the marquees in the car park as they take over extra space for this sale! And nice warm heaters to keep everyone warm! And I recall picking up an excellent kids used snowboard for $50. So sometimes it may be even better to buy than hire!